Appointed in May 2011, Dan is responsible for integrating activities across General Motors Global Manufacturing Engineering Centers – Body Systems, Vehicle Systems, Powertrain Systems, and Manufacturing Planning. Critical Business functions managed include industrial engineering, global manufacturing capital forecasting/balancing, manufacturing asset management, common Manufacturing Engineering process development, advanced manufacturing engineering strategy, advanced manufacturing technology, and Manufacturing 4.0/Smart Manufacturing. 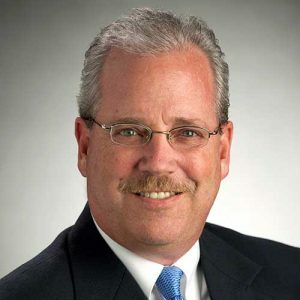 Prior to his current position, Mr. Grieshaber has held a number of executive leadership positions within General Motors including Director Global Die & Press Center, Director North American Manufacturing Strategy & Planning, Director Global Product Engineering/Body Structures, and Director North American Die Engineering. Experiences have progressed through a series of jobs with increasing responsibility, including brief assignments in both Germany and Brazil, along with management of global teams based in Germany, Brazil, South Korea, China and the United States. Mr. Grieshaber earned his Bachelor’s Degree in Mechanical Engineering from the University of Michigan in 1985 and a Master’s Degree, also in Mechanical Engineering, from the University of Minnesota in 1986.